My, oh my! The LBA Woods has changed much since the March 11 “Sunday in the Woods” blog post. Back then, tree and flower buds were swelling and there was no sign of the lovely “Duck’s Foot” or “Inside-Out Flower (Vancouver hexandra)(above). Now, the forest is erupting in blossoms of many shapes and colors. 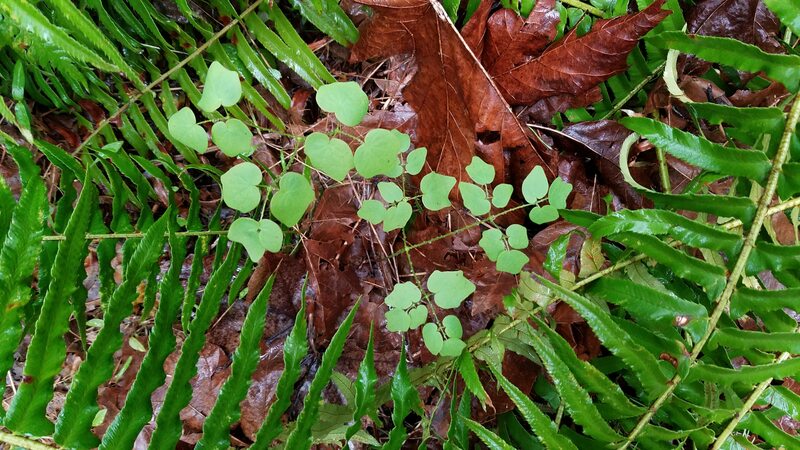 For those of you who joined our March 27 nature walk, here are 5 of the 22+ plants our guide, Marian Bailey, included in her Upland Forest Ecosystem Walk. Ocean Spray ( Holodiscus discolor) showing tiny new leaves on stems still holding last year’s clusters of blossoms (now brown). Osoberry/Indian Plum (Oemleria cerasiformis) flowers from beneath. Oregon Grape (Mahonia/Berberis nervosa) flower buds. A more wary Big-Leaf Maple (Acer Macrophyllum) flower cluster (on same tree as flowers above).